Oil pits, reserve pits, and drilling sumps are typically used to store fluids and mud produced by the drilling process. These fluids can be highly contaminated with salts or chemicals and require an impermeable geomembrane barrier. Layfield offers a variety of highly flexible, prefabricated, durable geomembranes that meet or exceed current containment standards. Enviro Liner® 3000 (only available in the US) in 20 and 30 mil thicknesses is an economical lining material made from blended/reprocessed resins for optimum performance at the lowest cost. Enviro Liner® 4000 in 20, 30, and 40 mil thicknesses has excellent chemical resistance, flexibility and UV resistance. Enviro Liner® geomembranes can be factory fabricated, allowing us to mobilize very large, one-piece pit liners and often eliminating the need for field welding or site fabrication. 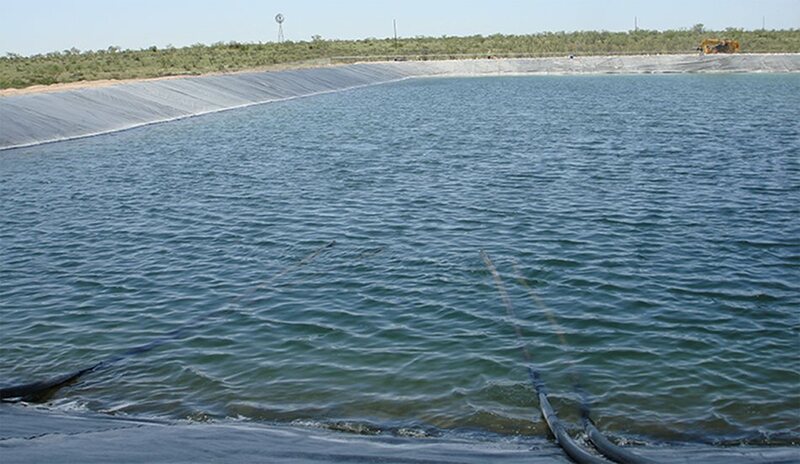 Layfield Environmental Containment provides engineering, design, construction (installation), and maintenance services of many types of geosynthetics products with a focus on geomembrane liners and floating covers. We have one of the largest, most experienced installation crews in North America. Use the links in the menu below to view the products and services available for this application and to access other applications.